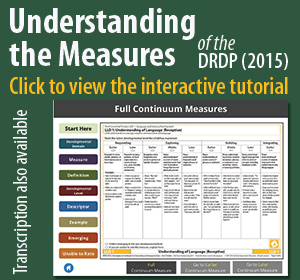 Complete training (face-to-face and/or online) on how to use the DRDP (2015). Observe children over time to complete the assessment in the fall and spring. Collaborate with other service providers and families in gathering DRDP (2015) information. Submit a Rating Record and Information Page to your SELPA for every child assessed and maintain copies of all records. The DRDP (2015) assessment was developed by the California Department of Education for young children and their families to inform instruction and program development and aligns with the California Department of Education’s Early Learning and Development Foundations. These pages include links to the Infant/Toddler View and the Preschool Fundamental View of the DRDP (2015) as well as required forms such as the Information Page and Rating Records. The resources on these pages will help you plan and gather your observations and other documentation to complete the DRDP (2015). The resources on this page will assist you in better understanding and using the DRDP (2015) with infants and toddlers with Individualized Family Service Plans (IFSPs) and with preschool Individualized Education Programs (IEPs). Having conversations with families is an important part of completing the DRDP (2015) for all assessors, but it may be particularly important for practitioners such as home visitors who may not have frequent opportunities to observe the child participating in a variety of routines and activities. The resources on this page will assist you in planning and leading these kinds of focused conversations with families. An important feature of the DRDP (2015) for children with Individualized Family Service Plans (IFSPs) and Individualized Education Programs (IEPs) is the system of adaptations. Adaptations are changes in the environment or differences in observed behavior that allow children with IFSPs and IEPs to be more accurately assessed in their typical settings. Adaptations serve an essential function – to make sure that the DRDP (2015) measures ability rather than disability. The resources on this page will assist you in understanding and using adaptations effectively.